An opportunity to burn off some Xmas pud! We will start from Wallingford Market Place (SU 6073 8941), there is plenty of parking in the Waitrose Car Park off of the High Street nearby (SU 6060 8945). If this car park is charging on a Bank Holiday use the one in Goldsmith's Lane nearby which doesn't have a 2 hour limit. This one charges �3.30 for up to 8 hours but not sure if charges apply on Bank Holidays. Plan is to cycle for about 2-3 hours to a lunchstop and then a short hop back to Wallingford before it gets dark. Lights are strongly recommended though. Distance will be about 35 miles and there will be one moderate hill and a couple of smaller rises (nothing very demanding though). Easy touring pace of around 10-12mph average. 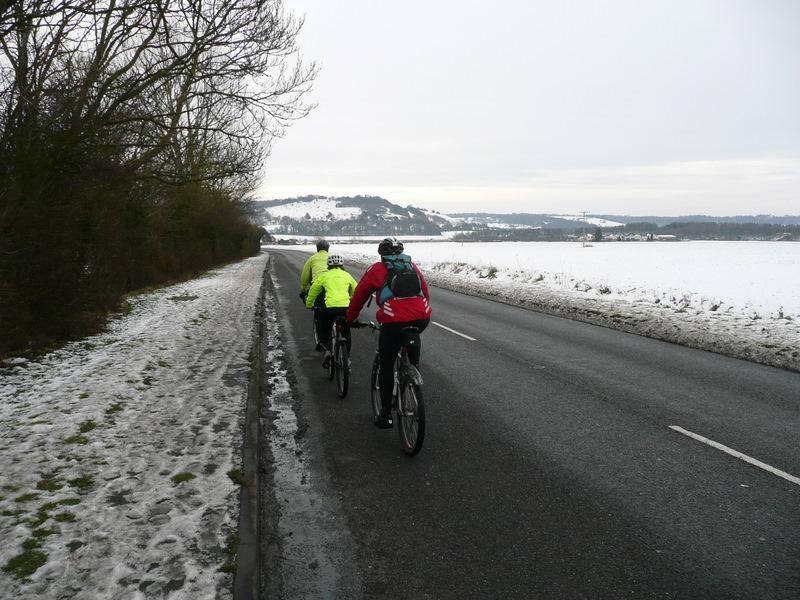 Route will head up to Christmas Common and along the Chiltern ridge before dropping back down at Kingston Blount. We will return through small villages to Benson and back to Wallingford. Just turn up at 10:00am at Wallingford if you would like to join the ride. A group of us are going to give the ride a go. Benson forecast is for temperatures between 0 and 2C tonight and tomorrow. Wallingford had about 2" of snow last Saturday which was patchy by Thursday. Some of the minor roads might be icy still but we'll see how we get on and amend the route if necessary. Please note car park details above. You might need to use the Goldsmith's Lane car park and not the Waitrose car park. 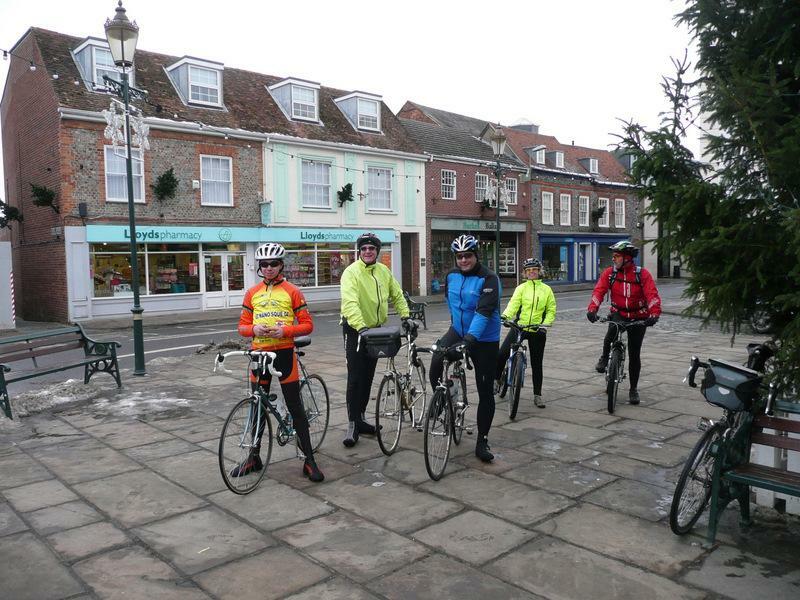 Eight brave riders gathered under the Christmas tree in Wallingford Market Square for the Santa Special ride. Including a warm welcome to 14-year-old Jamie who was on a family visit from his usual home in France. With snow still on the ground it was very Christmassy! However this snow was to be our undoing fairly early on as we attempted to climb up to Christmas Common from Crowmarsh only to be thwarted by deep snow covering the entire road. Minor roads were obviously a no go area so we descended and had a quick rethink and made a new loop sticking to A and B roads which were pretty quiet in most places as it was a Bank Holiday. We headed north to Shillingford on the A4074 before taking the A329 to Stadhampton, Little Milton, Milton Common and Thame. This latter road was pretty quiet as far as Stadhampton, the bit from the M40 junction to Thame was busier. We threaded through the sales shoppers in Thame to take the B4012 to the A40 at Postcombe. This stretch was straight into a biting SE wind and was really hard work. The short bit along the A40 to Lewknor was really tough going into the wind. We turned onto the B4009 which took us out of the worst of the wind to Watlington, this road was rather busy with cars but nothing really bad. We continued to Benson and a lunchstop at the Waterfront Caf�. Bryan and Janet needed to get back to Harwell on their bikes so they headed off at this point. Once our feet had thawed - to be honest the ride wasn't that cold out of the wind. With an average temperature of 4C it was actually warmer than the ride I led at the beginning of December! - we headed back to Shillingford this time turning left over the Thames and back to Wallingford. All in all I think we did rather well to get out on a ride. It was a shame we had to stick to main roads but we didn't have much choice. Thanks for joining the Santa Special, I hope we can do it again next year!